The work of Carl von Clausewitz employs a well-tested, widely accepted theory of warfare, particularly the use of force and a commander’s rationale for combat. For the layman, such as myself, the study of Clausewitz is often confined to his examination of a state versus state battle for territory with the event itself being financed by the state. (Clausewitz, 1976). Clausewitz described battles that were decisive and could lead to negotiations of surrender by the defeated party (Munkler, 2005, p. 12). What is less spoken of is his study of small wars and people’s war. In the first, he explores the use of special units, tactics, and intelligence gathering techniques that relied on the knowledge of local communities to effectively engage an enemy. An adversary that could be numerically superior or have other advantages that made head to head battle problematic. In the second was his analysis of popular uprisings within a community that were at times more difficult to control than countering the efforts of organized armies sponsored by the state. Clausewitz referred to examples of small wars and the use of guerrilla tactics and insurgency throughout his work. He saw it as a recognized component of warfare that was in no way unique (Heuser, 2010). A terrorist organization has the ability, if willing, to negotiate with the state but apart from the release of some of the kidnapped schoolgirls from Chibok, negotiation is seldom broadcast as an option in the Nigerian government’s dealings with Boko Haram. And yet the government during the worst days of the insurgency set deadlines for when hostilities would end linked to what it claimed would be total victory against the insurgents. Is a decisive victory even possible against what is at times a faceless enemy that changes tactics rapidly as a prominent feature of its operational ethos? While western, the reliance on one of the more prominent and widely known aspects of Clausewitzian theory cannot be dismissed as Nigeria’s military commanders are often trained in the West or study warfare using western texts often heavily influenced by Clausewitz. I am in no way attempting to rob them of their agency to adapt to the tempo of warfare in the northeast, but the links to western ideas must be noted. Unlike their western counterparts, access to training and equipment necessary to adequately perform core duties is in short supply. That will be explored later. Further, the reporting on Boko Haram is often done using western concepts and/or bias. Boko Haram’s battle tactics in Borno state range from traditional acquisition and control of territory which at its height included a caliphate the size of Belgium. It has also included guerrilla raids on villages and state controlled facilities. Terrorist attacks most recently utilizing children, often female, in bombing of civilian targets has also been employed. Boko Haram attacks are heavily concentrated in the northeast, but its impact has been felt throughout Nigeria. Figures 1 and 2 capture the scope and range of Boko Haram attacks (Economist 2014; Los Angeles Times 2014). Boko Haram in its various iterations has included enough of the traditional and widely recognized aspects of warfare, head to head battle with insurgent versus state forces, as well as the use of guerrilla and special units to sufficiently test the centuries old theories of Clausewitz even in this most modern of armed conflict. Failed states are tense, deeply conflicted, dangerous, and contested bitterly by warring factions. In most failed states, government troops battle armed revolts led by one or more rivals. Occasionally, the official authorities in a failed state face two or more insurgencies, varieties of civil unrest, different degrees of communal discontent, and a plethora of dissent directed at the state and at groups within the state (2004, p. 5). Nigeria has active, deadly conflict in its northeast and middle belt, at a level that ranks the non-state actors as among the three deadliest terrorist organizations in the world (IEP, 2015) Nigeria also has simmering tensions in its south, northwest and east. One could question if all the developing situations were to worsen if the state could respond to full scale insurgency on five fronts. The fact that the Nigerian state continues to lead the continent in terms of the size of its GDP and had exhibited signs of steady growth during some of the worst years of active conflict call to question whether a cessation of hostilities is even in the interest of the state at all. One could question the relevance of Clausewitz war theory in a global system where attainment of neoliberal economic objectives is of arguably greater value than service delivery, investment in infrastructure, and safeguarding worker and human rights. Before one can analyze battle it would be necessary to interrogate the boundaries of that analysis. Clausewitz has done this, but one could argue that it simply does not fit neatly enough into a box that would contain descriptors of the modern nation-state, especially one in the global South at present. On the opposing side are those who have highlighted the fluidity of Clausewitzian concepts. Of note is the uncertainty of battle. And most of value in this study, the impact of the opening of democratic space on the possibility that conflict may be heightened rather than reduced. Clausewitz realized that the radical transformation of the scale and nature of war in his lifetime was due to a deeper phenomenon. This was the new participation of the citizenry as a whole in politics, a participation that characterized the transition from the modern state to the modern nation-state. Broadened political participation was at the heart of the French Revolution, Napoleon’s successes, and also—ultimately—the measures adopted by Napoleon’s opponents in order to defeat the French. Clausewitz understood political participation as stimulus for, exercise of, and constraint upon power. He knew that neither the Revolution nor the reforms created to combat it could be rolled back for long, because, as he wrote in his manuscript On War, "...once barriers—which in a sense consist only in man’s ignorance of what is possible—are torn down, they are not so easily set up again." Thus the devolution of power—the democratic, egalitarian or fragmenting trends we have heard so much about at this conference—are related to the development of the nation-state itself and the continuation of broad trends that created the context for all Clausewitz’s attention to the phenomena in and of war (Beyerchen). Beyerchen releases Clausewitz from the confines of war theory and by doing so forces the audience to look beyond the spectacle of the violent act itself to the root cause. That this cause might be democracy, especially in an environment that has not had a long history of embracing the western form of this style of governance could be as much a factor in conflict as it was on the continent (Europe) where western models of democracy took shape. Beyerchen’s interpretation could lead one to view insurgents as political actors. While not a state they are relevant, identifiable agents with a grievance against the state. In the view of Clausewitz and in the history of democratic formation in Europe and the West generally a legitimate address of grievance has been violence. There should be no surprise when the same occurs in the developing world. Clausewitz is saying that the state is a contested concept. As a result, how we define combatants is also worthy of debate. Clausewitz idea that war is the visible manifestation of policy/politics by other means, would then permit an insurgent to be viewed as a legitimate political actor. In the case of the Nigerian state, where inequality, corruption, and nepotism are commonplace, is an insurgent acting in a way outside of the democratic norms made visible by government? Under Clausewitz one would engage the insurgent as a product of the state. The lens would need to be adjusted to determine root causes and to humanize an actor that has been previously dismissed as unworthy of analysis. As stated previously Clausewitz recognized non-state actors, their motivations, and tactics as relevant to the study of war and state formation. Following Clausewitz would result in insurgent grievance being carefully considered by the state. The reality is that in many Sub-Saharan African states where terror groups are present, democracy exists in name alone. Governments embellishing themselves with multiparty elections, liberal constitutions, and other facades of democratic governance, preside over regimes which are political, socially and economically exclusive […] As it stands, what has been sold as democratic rule in the terrorist-embattled parts of Sub-Saharan Africa has not only failed at combating terrorism -- it has enabled it. In the absence of reforms, the appeal of rigid, God-given governance will continue to resonate in contexts where faux democracy has failed. (Cummings, 2016). For Cummings and Matfes, any form of governance is better than nothing at all. The absence of the globally recognized state in relation to delivering service to its citizenry leaves it subject to be replaced by actors such as Boko Haram. Viewing it not solely as a terrorist group but also a form of “para-government” allows one to study the northeast insurgency in a way that could lead to conflict resolution as the good/bad binary is shed to examine what initially created the situation. Clausewitz understanding of the stages of state development, popular response to democracy, and the role of violence in state-building takes his centuries old theory and makes it relevant to the study of a society that is actively questioning the purpose, relevance and ultimately the very existence of what constitutes a functioning state. The New War theory makes interesting points regarding the battlefield and the tactics of insurgent elements but less so of the nature of state supported armies in the developing world. Now this is where the ‘new’ can be extracted perhaps. Observing Nigeria’s low military expenditures and the misappropriation of those funds brings into question how prepared its military would be to fight any variety of conflict—traditional, or asymmetrical. Every aspect of its military preparedness has been affected by corruption. When only 11% of dedicated military funding impacts training or the weapons to wage war, the way money travels through official and illicit networks in Nigeria must be understood prior to an exploration of tactics (Nzeshi, 2014). Despite clear indications that a number of officers greatly enriched themselves during the period of military rule - the current government alleges that General Abacha alone may have stolen several billion dollars - the institution itself has been starved of resources. An external audit of the Nigerian military completed last year provides a sobering assessment of its current state of health. Some 75 per cent of the army's equipment was found to be faulty or out of commission. Its performance leading a regional initiative to end civil wars in Liberia and Sierra Leone during the 1990s was "abysmal by any professional standard". Training procedures have "deteriorated sharply". Conditions in the barracks are described as "deplorable". Other services have fared no better. The navy has 19 admirals and 34 commodores, but can put only nine primary vessels to sea. The Air Force has between 10-13,000 personnel. A handful of Alpha jets and some single-engined trainers are operational. All the Russian MiG-21 and Anglo-French Jaguar fighters have been grounded for years, while just one of the eight C-130 transport aircraft is flying. Western defence attaches are at a loss to explain what so many people in an air force with so few aircraft and a navy with so few ships might usefully be doing. "Things are in a real mess," says one. "It's hard to know even where to start." (Goldman, 2000, p. 7). The Nigerian military is not well resourced and poorly trained (Global Security, 2016; Daily Independent, 2014; Global Firepower, 2016). Boko Haram if considered a cohesive combat force has at times been equal if not superior to it. Prior to the relocation of the Nigerian army command from Abuja to Maiduguri in 2015, one could question whether there was even sufficient troop presence to counter insurgents and reclaim lost territory (Ibeh, 2015). Clausewitz never dismisses the relevance or lethality of non-state combatants. His writing makes it clear that they are often a factor in the battlefields that he studied as part of his theory of war. He never “othered’’ non-state actors and found nothing particularly notable about their presence in the theatre of war. Clausewitz’s philosophy of war has been challenged by Mary Kaldor and others who champion the concept of New War. Although Kaldor’s research focus was the Balkans other theorists have applied the theory to conflicts in the global South. It has been offered as a counter to Clausewitz which itself has been considered universal regardless of the author’s intent. The new war theory exists within a larger interrogation of the impact of globalization with its accompanying neoliberal economic pressures, particularly its impact in nascent democracies. The end of the Cold War is sometimes used as a benchmark. There is emphasis placed on acts of aggression to control civilian populations rather than to engage in head to head battle with opposing armies (Kaldor, 2013). Old War refers to an idealized version of war that characterized Europe between the late 18th and the middle of the 20th century. Old War is war between states fought by armed forces in uniform, where the decisive encounter was battle. Old Wars, as Charles Tilly has convincingly argued, were linked to the rise of the modern nation-state and were state-building (Tilly, 1990). '[W]ar made states, and vice versa .' says Tilly (Tilly, 1990, p. 67). In wars, states were gradually able to monopolize organized violence and eliminate private armies, brigands, feudal levies, etc. and establish professional forces subservient to the state. Taxation and borrowing were increased, as were administrative efficiency and public services and, above all, the concept of political community was forged. Imagined communities, based on the development of newspapers and novels in vernacular tongues through which people who spoke the same language came to see themselves as part of one community, were consolidated in war. Carl Schmitt talks about the concept of the political that underlies the modern state. For him, intrinsic to the concept of the political is the friend-enemy distinction, and this, he says, is linked to the 'real physical possibility of killing' (Schmitt, 1990). The job of the state was to defend territory against others, and it was this job that gave the state its legitimacy. ' Protecto ergo obligo ' ('I protect therefore I am obeyed.') says Schmitt 'is the Cogito Ergo Sum of the state' (Schmitt, 1990, p. 52). Old Wars were fought according to certain rules at least in theory, codified in the late 19th and early 20th centuries in the Geneva and Hague Conventions -- rules about minimizing civilian casualties, treating prisoners well and so on. Rules were critical to establishing the legitimacy of wars. There is a fine line between heroes and criminals, legitimate killing and murder. The quote places the study of war squarely within a western context. Was there no history of armed conflict in what is today known as the global South? Does history begin and end in the West? Those questions are not examined and the absence of analysis deems them unworthy of study. This is the problem that hovers above what is positioned as a well-informed, global analysis that purports to analyze warfare outside of the restrictions of Clausewitzian orthodoxy. Is it even possible to challenge Clausewitz without breaking free from the geographical parameters of his subject matter? Clausewitz was from an age when it was unnecessary for a European scholar to consider anything other than Europe. The new war theorists come from a period where Third World intellectuals and movements were at least visible if not embraced by the West. Ignoring them is a deliberate act. It is an embrace of western universality. New War theory is controversial as some critics accuse it of “othering” political violence in the global South. In other words, projecting conflict in the developing world as somehow exotic and more brutal than what has happened historically in the North (Munkler, 2005, p. 24). What Munkler is speaking of is not simply an exoticism of violence but more directly a view of the global South as unable to develop because of an inherent barbarism. This is no different than what was claimed to be motivation for colonial conquest in the days of old. Is the West using New War as a pseudonym for non-OECD savagery? The question is a critique of the modern western gaze very much aligned with racist notions of non-white people. Munkler is not interested in critical race theory but he does touch on something as current—the spectacle of violence in an age where any event of significance can be captured on video and done so without analysis. In line with Munkler, is the idea supported by statistics that modern warfare has been less brutal than those that predated the end of the Cold War (Melander, Öberg and Hall, 2006, p. 30; Cohen, 2011; Lacina & Gleditsch, 2005; Themner & Wallensteen, 2011). The depiction of a post-Cold War savagery, minus the deliberate and highly visible guidance of the West in pursuit of its own claim to territory or allegiance, is a fiction fuelled by its own agenda. An agenda that must be unpacked. Third Worldist arguments concerning inequality and exploitation within the global system, on one hand, and views that focus on domestic failings and inadequacies, on the other, both reflect valid aspects of distinct but interconnected realities. […] In redefining underdevelopment as dangerous, from its position of dominance liberal discourse has suppressed those aspects of Third Worldism and international socialism that argued the existence of inequalities within the global system and, importantly, that the way in which wealth is created has a direct bearing on the extent and nature of poverty (2001, p. 28). The new way of thinking isolates the South as if it is not influenced and/or controlled by the global market. With this logic southern problems are now entirely of their own making, yet they are still best solved by the West. This is merely a repackaging of colonial thought (Duffield, 2001, p. 32). In this, the missionary of old has been replaced by the NGO—a cosmetic change at best. But Duffield goes further by highlighting a new network of actors working together and profiting from research and campaigns on conflict in the global South— “academics, military establishments, NGOs, private security companies […] (2001, p. 36). Following this train of thought a practitioner would have to consider abandoning the old ideas. The new can be sold at a much higher price than stale theory. And donor agencies like innovation. Duffield is doing something very daring here. He is defining the profit motive of those who study and purport to being interested in solving global conflict. That he is laying this truth out without excluding his own profession is more than refreshing. It re-globalizes conflict by shining a light on the storyteller. It is pointing the camera lens back in the direction of the photographer and questioning the western gaze. If one acknowledges the existence of globalization, how then can one refuse to analyze the role of the West/OECD countries in the spread of conflict and all that comes from it—refugees, IDPs, human trafficking, child labor, etc. Stephen Reyna dismantles Kaldor’s thesis completely. He highlights six aspects of new war theory that he rejects as novel. These being that the new warfare is embedded within a new reality; that they are at their root civil wars; that crime and war converge and that this is a new phenomenon; that new wars are propelled by identity rather than ideology; that new wars often involve private militaries and militias; and finance of war through illicit sale of goods or plunder is a new element in today’s battlefield (2009, pp. 294-296). Reyna dismisses Kaldor’s claim with historical examples that illustrate how each has been an element of warfare for centuries and is in no way new. He goes further by saying that new war’s very creation as theory is built upon an imperialist need, considered benign, to control the global South and save it from itself (293). Reyna goes further than most in reversing the critical gaze of the West upon the South as he states that the current global political violence, “is not so much the result of criminal terrorists in weak states run amok, but the result of killing elites in powerful empires run amok, desperate to reproduce their less and less reproducible global capitalism” (312). Through Reyna, one would have to consider an indictment against the West; no differently than one would look to Boko Haram militancy in Borno and/or Nigerian handling of dissent as a cause of conflict. Although Kaldor does not distance the effects of globalization on the ramping up of conflict in the world today, Reyna is taking it a step further. He is saying that the new war theorists are acting to legitimize the greed of the West by creating a dangerous other that must be stopped by any means necessary. If that results in the violation of human rights, international law, or the sovereignty of another nation, so be it. The theorists in his view are writing, “texts [that are] encouraging barbarism in the name of civilisation” (Reyna, 2009, p. 313). Human rights violations on both sides of the conflict are well documented (DRL, 2016). The Nigerian government appears no better than Boko Haram in recent reports (Amnesty International 2015). The very framing of post-Cold War conflict as “new” allows policy-makers to prioritize state sanctioned violence and oppressive tactics to deal with “savages” devoid of legitimate grievances that cannot or should not be reasoned with (Schuurman, 2010, p. 98; Reid, 2007). What is a relatively new phenomenon being the use of suicide bombers as a tactic employed by insurgents in Nigeria. The literature speaks of this as a response by local combatants to the presence of an invading army. Robert Pape explores this tactic from the Second World War through 2003. With some reference to much earlier applications (Pape, 2005). His framing in part allows for acceptance of Clausewitzian theory as asymmetric warfare has existed for centuries altered by access to new weaponry or approaches to even the odds on the battlefield. If applied to Nigeria, this theory requires a mapping of the region along ethnic, religious, socioeconomic, and ideological lines rather than the recognized borders of the state. The insurgency might then be perceived as a response by the Kanuri people of northeast Nigeria or other ethnic groups to government authority that it does not recognize as legitimate (Ogbonnaya et al., 2014). Are there linkages to be found in this insurgency with the more widely studied Biafra separatist movement? 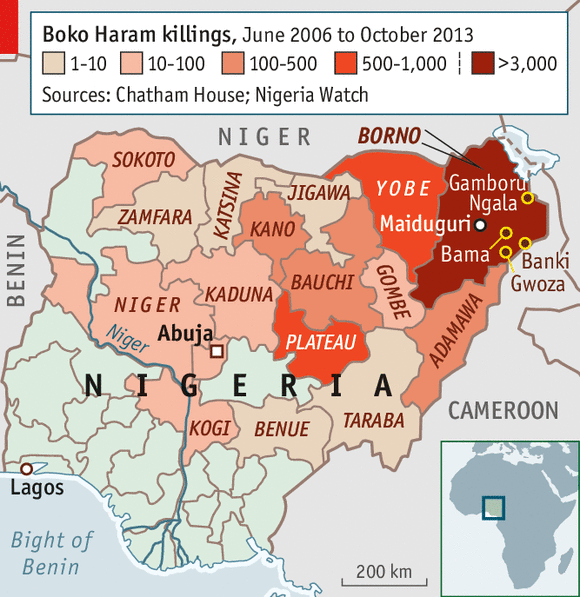 How much popular support can Boko Haram claim? If not a transmitter of a unifying religious and cultural philosophy, it at minimum, could be valid in its articulation of the need for rapid reform of state institutions and the necessity of a thorough check on corruption within the Nigerian state. A U.S. Congressional Report speaks of a shift from opposition to support of Boko Haram in the early years of the insurgency. The report claims that northeast residents saw it as more honorable than the Nigerian state in its aims and a readily available instrument to carry out vengeance against an institution that has been neglectful at best, openly hostile at worst as it relates to the needs of citizens in the northeast (U.S. House of Representatives Committee on Homeland Security, 2013, pp. 24-25). Calling violent conflict “new” in any way erases the history of the act in the creation of institutions and states. It makes it more difficult to see a cycle of violence deeply rooted in decisions made long before the trigger of the weapon is squeezed. Clausewitz accomplishes more through giving credit to violence as a component of state formation. An emphasis on the act itself becomes open to cultural safari instead of a close reading of political violence. Beyerchen, AD [no date] Clausewitz, nonlinearity, and the importance of imagery. www.clausewitz.com/readings/Beyerchen/BeyerschenNonlinearity2.pdf [Accessed 10 March 2016]. Bureau of Democracy, Human Rights, and Labor (2016) Nigeria: 2015 country reports on human rights practices 13 April. Available from: http://m.state.gov/md252715.htm [Accessed 28 March 2016]. Cummings, R. (2016) 'Sham democracy' is fueling Africa's terrorism. CNN February 10. Available from: http://edition.cnn.com/2016/02/10/opinions/africa-terrorism-democracy/index.html [Accessed 10 May 2016]. Daily Independent (2014) Nigeria: The military and Nigeria’s defence 29 June. Available from: http://allafrica.com/stories/201406301573.html [Accessed 20 May 2016]. Duffield, M. (2004), Global governance and the New Wars: The merger of development and security. London: Zed Books. (Chapter 1, 22-43). http://cdn.static-economist.com/sites/default/files/imagecache/original-size/images/print-edition/20140906_MAM987.png [Accessed 2 April 2016]. Global Firepower (2016) Nigeria military strength. Available from: http://www.globalfirepower.com/country-military-strength-detail.asp?country_id=Nigeria [Accessed 18 May 2016]. Global Security (2016) Nigerian army. Available at: http://www.globalsecurity.org/military/world/nigeria/army.htm [Accessed 20 may 2016]. Goldman, A. (2000) Out of office but still in the picture: The military. Financial Times 30 March: 7. Ibeh, N. (2015) Boko Haram: Nigerian military moves command centre to Maiduguri Premium Times 8 June. Available from: http://www.premiumtimesng.com/news/headlines/184543-boko-haram-nigerian-military-moves-command-centre-to-maiduguri.html [Accessed 7 June 2016]. Institute for Economics and Peace (2015) Global Terrorism Index. Available from: http://economicsandpeace.org/reports/ [Accessed 14 May 2016]. Heuser, B. (2010) Small wars in the age of Clausewitz: The watershed between partisan war and people’s war. The Journal of Strategic Studies, 33 (1): 139-162, Available from: DOI: 10.1080/01402391003603623 [Accessed 12 June 2016]. Kaldor, M (2005) Old wars, cold wars, new wars, and the war on terror. International Politics, 42, 491-498, Available from: doi:10.1057/palgrave.ip.8800126 [Accessed March 15, 2016]. Los Angeles Times (2015) Mapping every Boko Haram attack 14 January. Available from: http://www.latimes.com/visuals/graphics/la-fg-g-boko-haram-20140707-htmlstory.html [Accessed 25 May 2016]. Matfess, H. (2016) “Here’s why so many people join Boko Haram, despite its notorious violence”, The Washington Post April 26. Available from: https://www.washingtonpost.com/news/monkey-cage/wp/2016/04/26/heres-why-so-many-people-join-boko-haram-despite-its-notorious-violence/# [Accessed 10 May 2016]. Melander, E., Oberg, M., and Hall, J. (2006) The ‘new wars’ debate revisited: an empirical evaluation of the atrociousness of ‘new wars’. [online] Uppsala Peace Research Papers No. 9 Department of Peace and Conflict Research Uppsala University, Sweden. Available from: http://www.academia.edu/3444289/The_New_Wars_Debate_Revisited_An_Empirical_Evaluation_of_the_Atrociousness_of_New_Wars [Accessed 10 March 2014]. Munkler, H. (2005) Chapter 1, The new wars. Cambridge: Polity Press. Nzeshi, O. (2014) “Nigerian defense spending—How it undermines insurgency war” The New Telegraph 14 October. Available from: http://www.african-defense.com/defense-news/nigerian-defense-spending-how-it-undermines-insurgency-war/ [Accessed 18 April 2016]. Ogbonnaya, U.M., Ogujiuba, K & Stiegler, N. (2014) Terrorism in Nigeria implications of Boko Haram’s movement for security and stability in the ECOWAS sub-region. African Security Review, 23(2), 145–160, Available from: http://dx.doi.org/10.1080/10246029.2014.903378 [Accessed 1 April 2016]. Pape, R. (2005) Dying to win: The strategic logic of suicide bombing. New York: Random House. Reyna, S. (2009) Taking place: ‘New wars’ versus global wars. Social Anthropology/Anthropologie Sociale, 17 (3) 291–317. Available from: doi:10.1111/j.1469-8676.2009.00078.x [Accessed 15 April 2016]. Rotberg, R. (2004), ‘The failure and collapse of nation states: Breakdown, prevention and repair’ in Rotberg (ed), When states fail: Causes and consequences. Oxforshire: Princeton University Press (pp. 1-51). Schuurman, B. (2010) Clausewitz and the “new wars” scholars. Parameters [online], Spring 2010: 89-100.Available from: http://www.academia.edu/4294139/Clausewitz_and_the_New_Wars_Scholars [Accessed 27 March 2016]. Themner, L. and Wallensteen, P. (2011) Armed conflict, 1946-2010. Journal of Peace Research, 48 (4): 525-536, Available from: doi: 10.1177/0022343311415302 [Accessed 21 June 2016]. Growing threat to the U.S. homeland. Available from: https://homeland.house.gov/boko-haram-growing-threat-us-homeland/ [Accessed 16 March 2016].